The Wright Tradition started in 1909 when Norman Wright opened his own business in 67 Newstead Tce, Newstead. His first commission was ‘Superb’, a shallow draught gaff-rigged center board yacht, built for James Hogan Smith. The yard’s prestige grew rapidly, in part due to stream of exquisite vessels that swiftly poured forth from its slipways (including such boats as ‘Olivene’, ‘Pathfinder’, ‘Stradbroke II’ and ‘Juanita’) but also due to Norman Wright’s personal reputation built when he worked as a tradesman at the renowned Whereat’s yard. During the following years, Norman Wright’s were involved with many projects that made history, including the building of Sailing Yacht ‘Francois’. This yacht was a 75 ft schooner and probably the largest racing yacht to be built by Wrights. 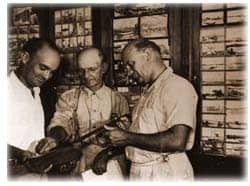 Following the outbreak of war in 1939, and particularly after the Japanese bombing of Pearl Harbour in 1941, the building of recreational craft was suspended in the wake of a wholesale diversion of resources towards the military effort. The military authorities engaged the Norman Wright yard to refit all types of small vessels for cargo work. The famous ‘Fairmiles’ was well known in war and the Navy commissioned Norman Wright to build four of their 112 ft patrol boats, known for their pace and effectiveness. After the return to peace in the late 1940’s, there was a great demand for work boats such as trawlers, luggers, and vessels for the tourist resorts. During this period, the yard built boats for the Barrier Reef islands of Lindeman, South Molle, Orpheus, Magnetic and Hayman. By the 1950’s, Norman Wright’s sons had increasingly assumed responsibility for the day to day operation. Ronald Wright was already an experienced boat builder and completed a university degree in Naval Architecture to become Queensland’s first Naval Architect. The sixties saw the departure of the younger Norman from the company but also heralded an onslaught of innovation in design and construction as Ron took on more and more of the designing and management roles. The yard produced yachts at the cutting edge of technology during this period, epitomised in the ‘Beryl May’ (later renamed South Pacific II) in 1961 and ‘Bali Hai’ in 1964. Ron continued to assert his design talent, creating the first 24 knot pilot boats ‘Flinders’ and ‘Oxley’ which nearly exceeded their lifespan threefold in service and the streamlined motor yacht ‘Dolphin’. During this period he cemented his prominence in naval design, gaining the enviable reputation of being one of, if not the, finest naval architects in Australia. With the passing of Norman Senior, Ron’s two sons entered the business, working their way up through the yard, already showing promise with elder son Bill winning ‘Apprentice of the Year’ and younger son Ian displaying the outstanding sailing skills of his descendents. In 1982 they assumed the role of the running the company with the construction of the 108 foot charter vessel ‘Elizabeth E II’. 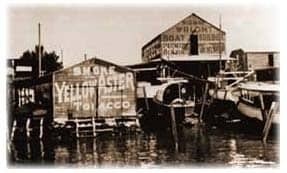 Boats of such calibre as ‘Wyllaway’, ‘New Horizon’, ‘Laura J’ and ‘White Haven’ followed as the brothers stamped their mark upon the business. The 1990s heralded a renaissance of boat building at the yard, with the production of such masterpieces as ‘Whistler’, ‘Restless’ and ‘Annabelle’, and foretold of the exquiste workmanship that would later be displayed on boats such as ‘Terna’, ‘Lionheart’ and ‘Bandanna’. These projects are demonstrative of Norman Wrights endeavor to keep up with the ever-changing technologies available. The ‘pilot boat’ developments are another prominent example of this. These vessels evolved from boat to boat, receiving feedback from the operators and the prompt resolution of any problems that needed addressing. The structure of the boats became stronger and lighter and the latest boats were designed to withstand “roll-over”. The developments from these boats spread into the boats built today. Currently the company is maintaining its pre-eminent position within the boat building industry, constructing multiple new generation City Cats, completing refits on a whole new scale and continuing to produce quality pleasure and commercial crafts of the highest quality. Bill and Ian Wright continue to strive to maintain this success and uphold the prestigious reputation their family business has built over a one hundred years of history. 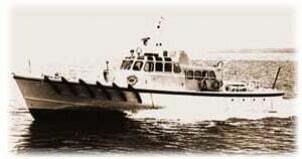 Norman R Wright and Sons has produced a vast variety of boat builders who in turn established their own businesses.